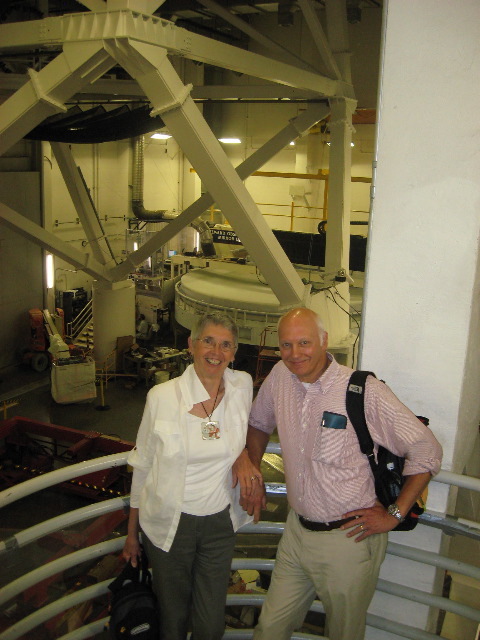 This is a photo of us during a tour of the Mirror Making Lab at the University of Arizona in Tucson in October 2007. When you come to visit, you'll find us here at "Starlight Farm". We live on a 10-acre farm at the edge of the tiny town of Barnesville, Maryland, where we're surrounded by green fields, woods and the dark sky above. From I-270, use Exit 22 - Maryland Rt. 109. Check your odometer at the bottom of the exit ramp as we are almost exactly 5 miles south from the end of that ramp. MD 109 is the same as Old Hundred Road, so no turns, no stop signs, just hills, fields and pretty views. When you've traveled 3 miles from the exit ramp, you'll pass The Comus Inn, a large country restaurant with a bright red roof. Keep going south on Old Hundred Rd. In another 1.5 miles, you'll go down a very long hill. As you come up the other side, you'll pass a brown sign marking the town limit of Barnesville, MD. We are the first driveway on the right after that sign. We have a white sign at the end of our lane - "Menke 22500 Old 100 Rd". The house is white and sits back from the road about 100 yards. Park behind the house and come in the back door (it's traditional in the country.) Phone 301-407-2224 if you need help. Nearby Restaurants: There are dozens to choose from in nearby towns, including chain restaurants such as Applebees or Outback Steakhouse, burgers or pizza, various ethnic places. There are too many to list; all will require a car to get there. The closest eatery to us is The Comus Inn just two miles north. Our favorite eateries are in Frederick, MD, a town 15 miles to the north. Frederick has a lively historic downtown that is becoming known nationally as a destination for good food and unique shopping (arts, antiques, locally produced crafts, interior design, etc.) Here is a recent article about the city's food scene. MARC Train to Washington, DC - The MARC Station is 2 miles from our house; Monday through Friday commuter service to Rockville, Silver Spring and Union Station. Click here for train schedule. METRO, Washsington DC Subway System - Daily service to all parts of the DC area. Closest station is Shady Grove, about 14 miles by car. Barnesville (population 160) has no services other than a post office. Poolesville, MD (about 7 miles) has a hardware, pharmacy, restaurants, gasoline, beer, wine, etc. It no longer has a full grocery. Germantown, MD (substantially larger than Poolesville, also about 7 miles from house) offers various grocery chains, pharmacies, big box stores, movies, auto repair, wide range of restaurants. There you'll also find community services such as a large public library, art center, indoor swim center, soccer fields, etc. Frederick, MD (population 65,000) is our nearest city, a 15-mile drive. It has all the shopping alternatives, a wonderfully preserved historic downtown, malls, theater, the bar scene, museums, colleges, and so forth. Here is a good site to help you get acquainted with Frederick.